When you think of islands and Central/South Amercia you would be forgiven for associating the two with Mexico’s Caribbean or Pacific coast islands, Belize’s barrier islands or perhaps, the even more exotic, Galapagos (on my bucket list before I snuff it). Places with crystal clear blue water and sun-drenched white or black volcanic sand beaches. What you don’t think of is a hut on Hayes Island (not an Island in the traditional sense at all) in the centre of Cardiff, which brings me to Vivo Latino (which started off as – and remains – a Central and South American restaurant in the Canton suburb of Cardiff, but which has acquired a small foothold in the city centre). Perhaps an odd location and certainly a brave move (the last operator of the hut in question – a Jamaican place – gave up the ghost “chilli” a while back), but one I very much applaud. Anything other than dull as ditch water chains in the city centre is a good thing as far as I am concerned. Chatting with them, their driver is to expand out from their Canton base. 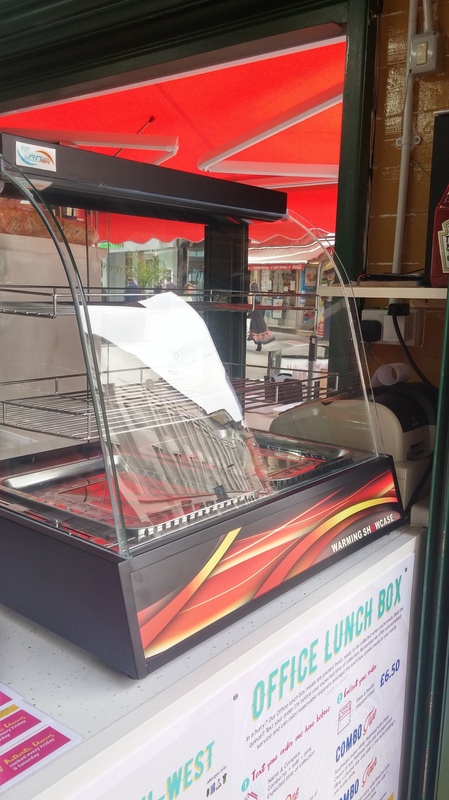 This is apparently doing well in the evenings, but footfall is a little lacking of a lunch time so a venture into the City centre to tap into the lunch time market makes sense. The added benefit is the ability to spread the word re the food they serve in their Canton headquarters. An admirable aim on both counts I thought. In essence it a hut – so really not much to say. You can, in effect, eat in with the tables on Hayes Island (and they have disposable plates for this) or take away. In nice weather, it is perfectly pleasant place to watch the world go by whilst eating lunch. In more inclement (usual) weather, take away is the only realistic option. 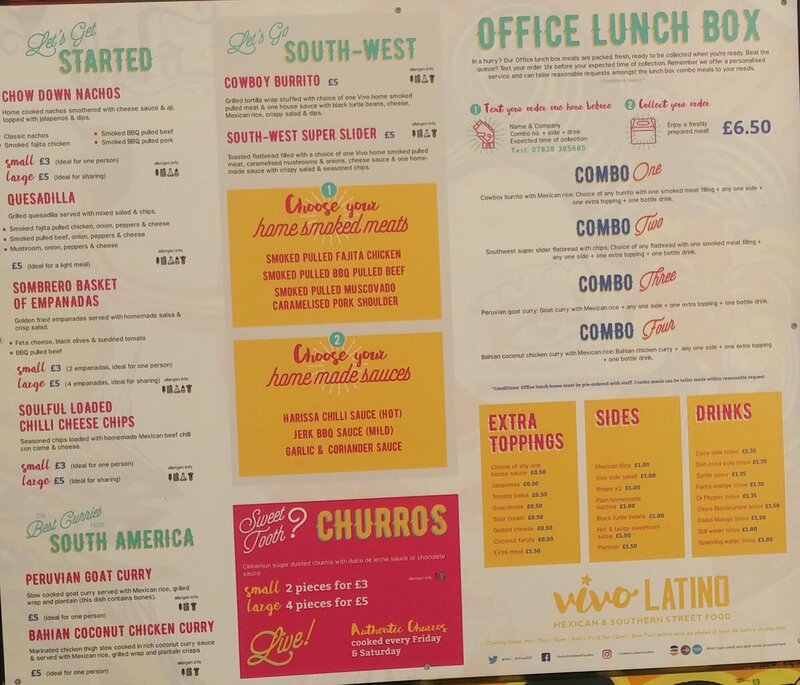 The menu offers a reasonable selection of Tex – Mex and Mexican classics (think nachos, burritos and quesadillas) as well as a wider offering from Central and South America (empanadas and Peruvian goat curry etc.). 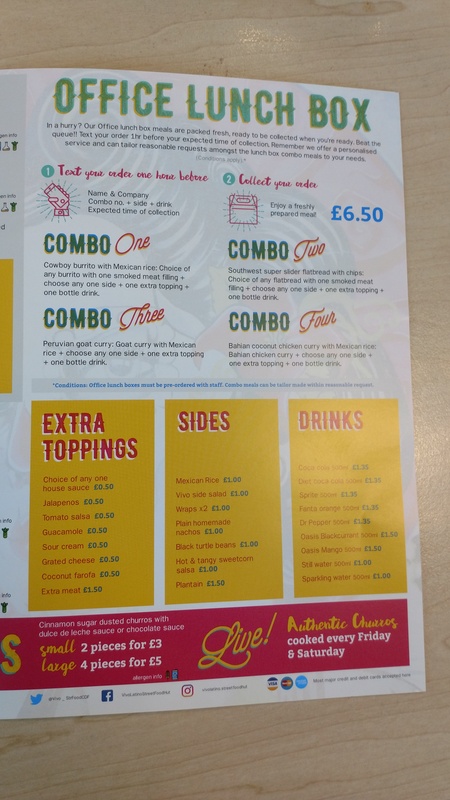 I like the idea of the ” Office Lunch Box” (which is a main order, a side and a drink for £6.50) which allows you to order in advance by text with your ETA for pick up. They have the ability to keep your order warm if you are delayed. Good idea that, as it means no waiting for your lunch to be prepared as it is there ready for you at your stated ETA time. The other advantage of this is you jump the queue. 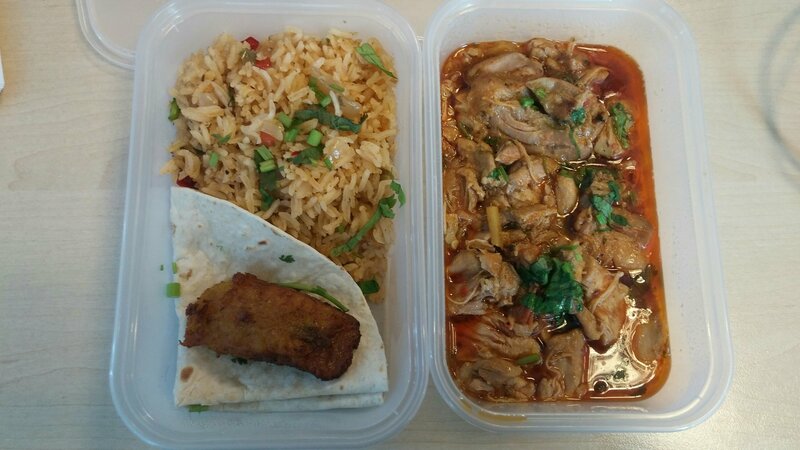 On my first visit I went for the Bahia coconut chicken curry (£5), which I took back to the office. This was a very decent sized portion, with a generous amount of tender chicken (thigh meat here – far tastier than breast and my preference for use in chicken curries) in the mix. From the photo it might look to some a touch oily, but a good stir when I got it back to the office sorted it. Not a hot (chilli wise) curry, but it had a pleasant level of spicing and the coconut came through nicey. The rice was well cooked and was laced with a nice mix of stuff. Bit of heat from some chilli and some crunch from spring onions, as well as the freshness of a decent amount of chopped coriander. The tortilla was fairly regulation, but a nice enough vehicle for mopping up the remnants of the curry. The final component was a rather pleasing chunk of plantain. I have always liked the starchiness of plantain (needs to be cooked for long enough, as is dreadful if undercooked – it was just right) and here it had a touch of caramelised sweetness to it that worked well with the chilli in the curry and rice. A nice dish, I though, and very good value for £5. On my second visit I went for the “Southwest Super Slider” (again £5). Not sure what the super slider connection is – looked like a torta to me. With the slider/torta, you get a choice of 3 fillings (smoked pulled chicken fajita, smoked pulled BBQ beef or smoked pulled pork). Slight gripe of mine here of is it really necessary to call everything that is not a slab of meat “pulled”? In my opinion, the ubiquitousness of the use of the term “pulled” is starting to get a bit (very) trite. Anyhow I went for the BBQ beef (was it pulled, honestly who cares?). 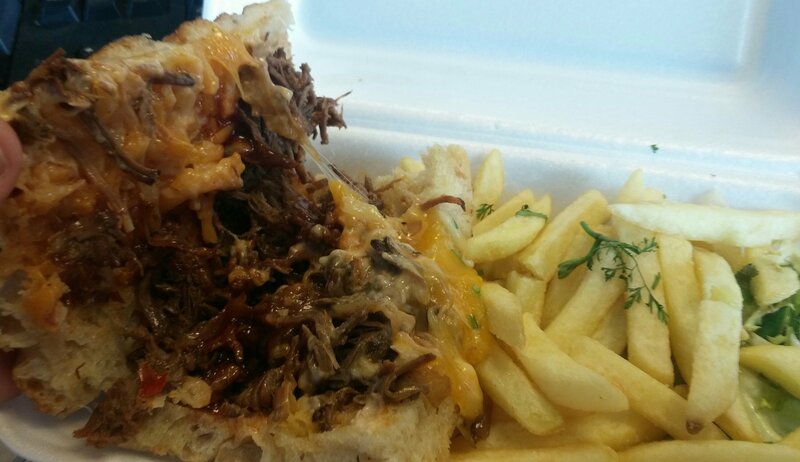 It came in a nice (almost focaccia style) roll, with the beef smothered in a nice bbq sauce and then topped off with a gooey cheese sauce. Sides were a nicely dressed green salad (love fact they had bothered to properly dress it, as undressed salad is rabbit food) and some chips. The latter were plentiful and nicely seasoned, but needed just a tad more fryer time to get them properly crispy. A third visit yielded a Peruvian goat curry. Within a rich, spicy, sauce (which left a very pleasing chilli tingle on the lips) sat tender chunks of bone in goat ( which has a bit of gaminess to it, flavour wise). 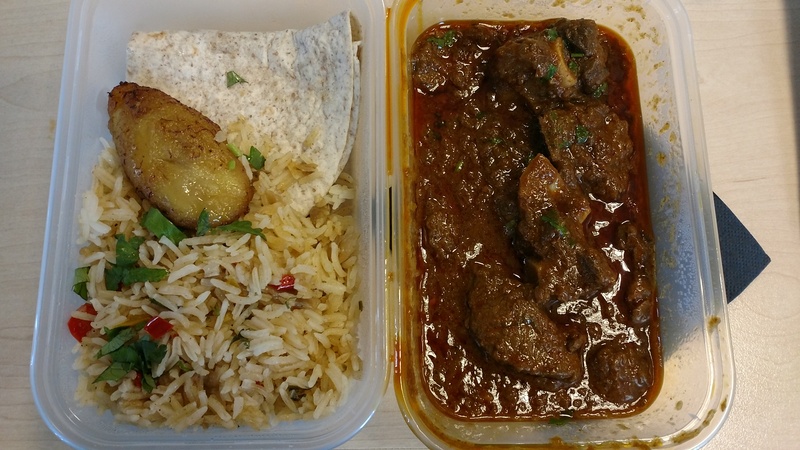 A very nice curry, with my only complaints being a somewhat high bone to meat ratio and less of a meat to sauce ratio than was present in the coconut chicken curry (as it is the same price – £5 – this is perhaps understandable, as goat cost more than chicken). It came with the same accompaniments as those with the coconut chicken curry, with these being equally as nice (the caramelised plantain actually worked even better with the spicier and hotter curry here). For those with a sweet tooth they do churros every Friday and Saturday. Not tried these as yet, so cannot vouch for what they are like. Tricky things to get right churros, in my experience, with the quality of the oil used being everything. Very few things are worse, food wise, than churros cooked in old oil. The usual suspects (on the fizzy/soft drinks front) are available, with pricing ranging from £1 for water to £1.50 for the “coloured water” (i.e Oasis) and fizzy drinks. 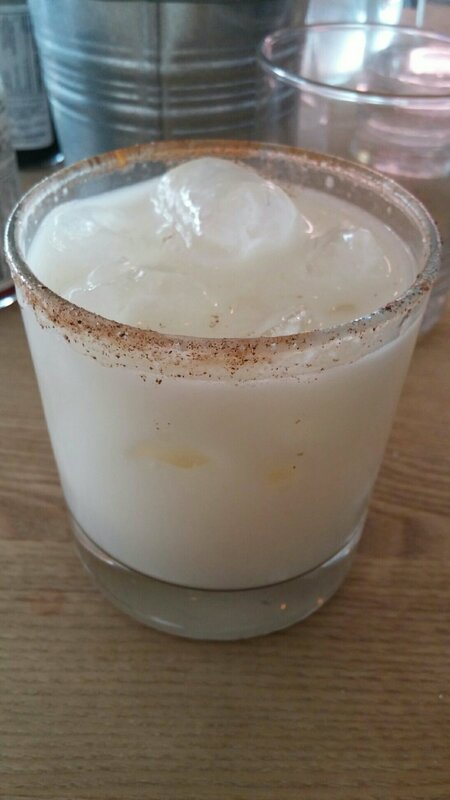 and/or Horchata for a bit of Mexican authenticity? Just a thought. 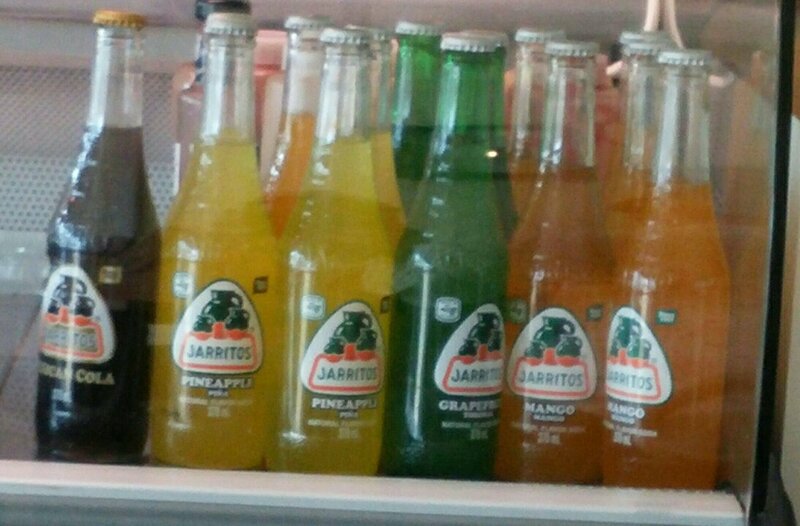 I quite liked Vivo Latino’s little brother (or should I say “hermano menor”) on the Hayes. Something a bit different from the uninspiring supermarket sarnies and for what you get, on the quality and quantity front, it offers very good value in my view. The food (all importantly) stayed hot on the 5-10 minute walk back to my desk and filled me up nicely. A good option if working late and thus needing something filling for lunch. As it opens till 8pm on Friday and Saturday it also offers the option of somewhere to fuel up before a night on the beers. Would I go back? 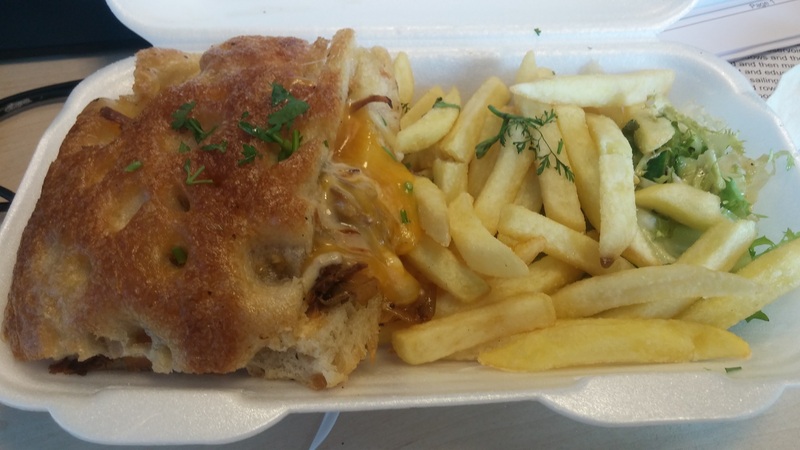 Yes – I enjoyed all three dishes I have had at this place and all in all I think it is a good addition to the takeaway/lunch time scene in Cardiff. I hope it succeeds. Text orders required to be placed at least one hour before closing time. 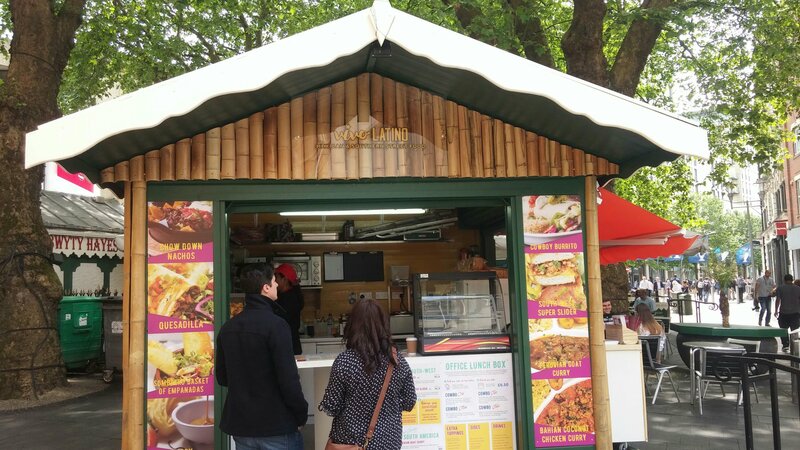 This entry was posted on Jun 25, 2017 by solicitingflavours in Barbecue, BBQ, beef, Cardiff, Cardiff restaurant, curry, desserts, Drink, Fast food, Food, food hut, food trailer, food truck, goat, Lunch, lunchtime, Mexican, New restaurant Cardiff, Non alcoholic drink, Pork, retail, review, salad, Sandwich, South American food, Street food, Take away, Takeaway, Uncategorized, Vivo Latino, Wales.